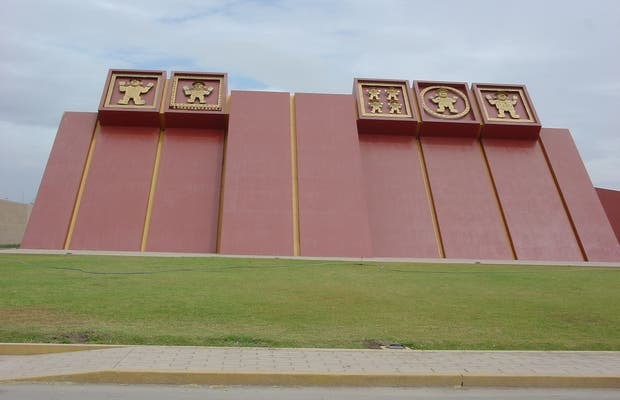 The Royal Tombs of Sipan Museum is in Lambayeque, 10 minutes north of the city of Chiclayo. It's open Tuesday to Sunday. It is a very modern museum that opened in 2002. Its appearance resembles that of a truncated pyramid with five prisms supported on inclined planes. Their colours, red and yellow ochre colours, remind the viewer of colours the Moche used in their decoration. The museum recreates the spirit of the temples of the Mochica culture, and is as much a museum as a mausoleum for the Lord of Sipan and his companions. Buen lugar para compartir cosas nuevas, aprender de una cultura muy rica con robots interactivos para una mejor experiencia .